5e Groupement de Combat was a regular organizational formation of the Canadian Army. The brigade group continued operations into the 21st Century. On 14 October 1953, the 1st Canadian Infantry Brigade replaced 27th Canadian Infantry Brigade in West Germany as Canada�s contribution to NATO. The Brigade returned to Canada In 1955, relocating its headquarters to Edmonton. The brigade was redesignated 1st Canadian Infantry Brigade Group in October, and in August 1958 relocated its Headquarters to Currie Barracks in Calgary. In 1972, redesignation to 1 Combat Group was followed by further redesignations in 1976 to 1 Canadian Brigade Group and finally in 1992 to 1 Canadian Mechanized Brigade Group (1 CMBG), reflecting changes in equipment and role. According to the formation's DND web page, the change to the CMBG title reflected the Army's "commitment to maintaining a general-purpose combat capability." Soldiers of the brigade group deployed in support of a number of missions around the world; initially Cyprus favoured heavily on the schedule. 1 Combat Engineer Regiment deployed to Kuwait in 1991 following the Gulf War, and in 1992 several Battle Groups were involved in the UNPROFOR missions to the former Yugoslavia, in Croatia and Bosnia-Herzogovina. When UN missions gave way to NATO peace enforcement in Bosnia and Kosovo, 1 CMBG soldiers participated in these missions as well and in 1999 1 CMBG troops led NATOs entry into Kosovo. In the wake of the shut-down of major Regular Force activity in Calgary, HQ 1 CMBG redeployed back to Edmonton in 1997. Units were also active in domestic operations such as the 1997 Red River Flood and 1998 Ontario and Quebec ice storms. 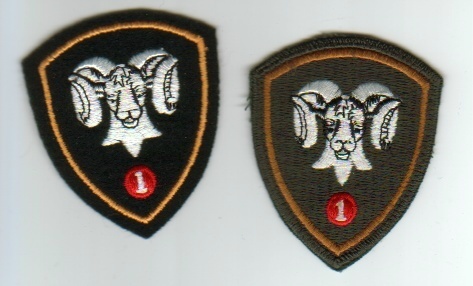 The brigade group wore a distinctive brigade patch on the DEU and Garrison Dress uniform, consisting of a ram's head, with a numeral "1".